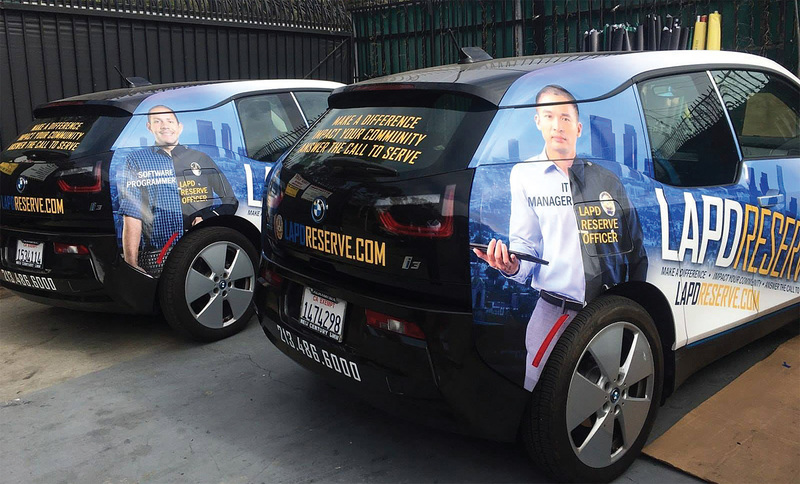 A couple of LAPD BMW i3s have been outfitted with reserve recruitment advertising, as part of the continuing Reserve Recruitment Initiative. Funding was provided by the LAPRF. The initiative has also included billboard and bus bench advertising. The 2018 Twice a Citizen/Reserve Officer of the Year banquet was our most successful ever! Once again, thank you to our Twice a Citizen honorees Michael Connelly, award-winning author and executive producer of the Amazon series Bosch, and its star Titus Welliver. The Department Reserve Officer of the Year, Kenji Inaba, since has gone on to be selected as the LAPD’s first Chief Surgeon and profiled in the news, resulting in further public awareness of the reserve program. Thank you, producer/actress Kiki Haynes, who brought elegance and humor to the evening, and retired LAPD Reserve Officer Bill Ahmanson, for co-hosting the evening. Mark your calendars for the 2019 banquet on May 4 at the Skirball Cultural Center. Chief Michel Moore’s leadership has already resulted in several key changes for the Reserve Corps. The reserve program has been moved from the Office of Administrative Services to the Office of Special Operations, under Assistant Chief Beatrice Girmala, a longtime leader and supporter of reserves. The reserve program is now within the newly established Community Relations Group under Commander Gerald Woodyard. Captain II Darnell Davenport, former OIC of ROVU, returns as Commanding Officer of the new Community Outreach and Development Division, with Lieutenant Curtis McIntyre as O/C of the Administrative Unit. Recruitment continues to be a focus of this Foundation, which goes to the heart of Corps’ sustainability. You will see a graph on this page that ranks the success of some of these efforts. Our billboard campaign featuring Dr. Shaquille O’Neal and several of our reserve officers continues to be very successful. New this year was our initiative to reimburse a portion of the Los Angeles Police Protective League’s Legal Defense Plan for Reserves. This provides extra “body armor” of civil liability protection. The reimbursement will continue in 2019. Stay tuned for details. With the help of Assistant Chief Girmala, the Foundation has been working on an initiative to reimburse LAPD reserve officers who choose to attend Peace Officers Association of Los Angeles County (POALAC) training. In particular, some of this training can be applied to the CPT requirement, similar to the ARPOC training for which the LAPRF reimbursed in previous years. Not to sound our own siren, but the Foundation again has been named by Great Nonprofits as a Great Nonprofit, for 2018. These ratings help us with donors by providing transparency vital to our fundraising efforts. Please consider writing a review: greatnonprofits.org/reviews/write/los-angeles-police-reserve-foundation-c-o-paul-favero-treasur. As we close out the year, we offer thanks to you and your families as well as happy holidays.